This beautiful canopy bed has true rustic charm! DutchCrafters log furniture is sure to make a statement plus it's Amish made! 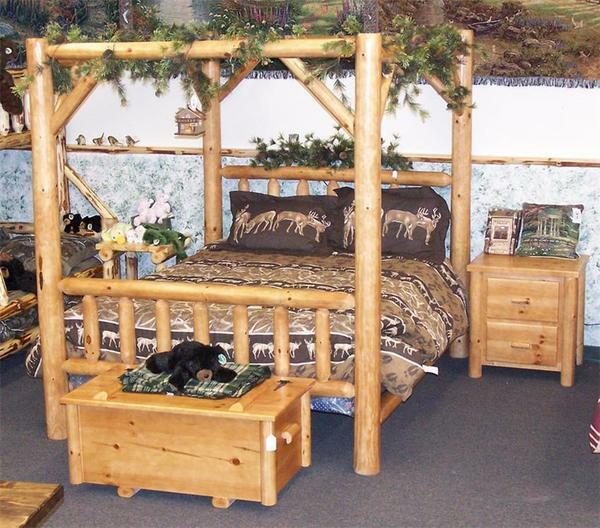 Choose from a twin, full, queen or large king size for the Amish Rustic Pine Log Furniture Canopy Bed. This rustic bed will bring a romantic feel into your bedroom. Check out our beautiful matching pine night stands, dressers, chest of drawers and armoires. If you don't see what you are looking for or would like something customized give one of our Amish furniture specialists a call at 1-866-272-6773. Twin Dimensions: 48" x 84" x 80"
Full Dimensions: 61" x 84" x 80"
Queen Dimensions: 72" x 90" X 80"
King Dimensions: 88" x 91" x 80"